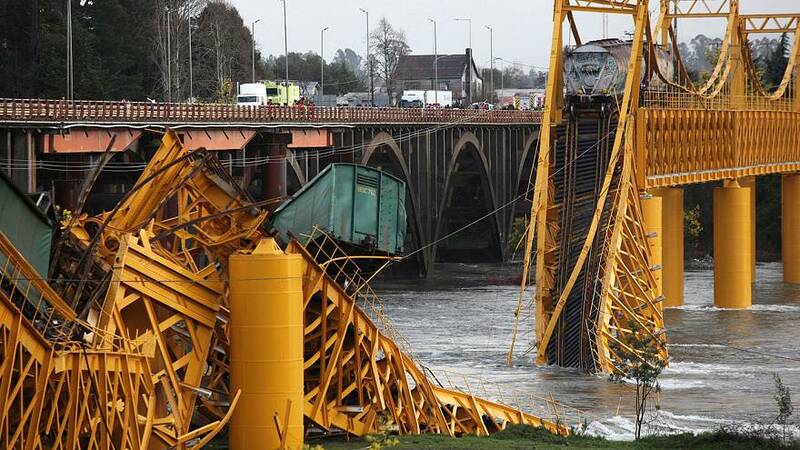 A railway bridge in southern Chile collapsed under the weight of a freight train that was passing over it. Miraculously no-one was killed or hurt in the accident. The state railway company (EFE) said six wagons plunged into the river below, and that the train was carrying chlorate, oil and sodium hydroxide. The authorities say there’s no evidence of contamination but people nearby and as far as 10 kilometres to the west were being advised not to drink the water. The accident happened at around 4pm local time on Thursday as the train was passing through the city of Pitrufquen in the direction of San Jose de la Mariquina.